1. To begin your 4th of July centerpiece, paint the Smoothfoam disc blue and the cube red; let dry. 2. Cut two 1” x 12” strips of the red striped paper and one 1” x 2” piece. Adhere to the side of the disc with double stick tape. 3. 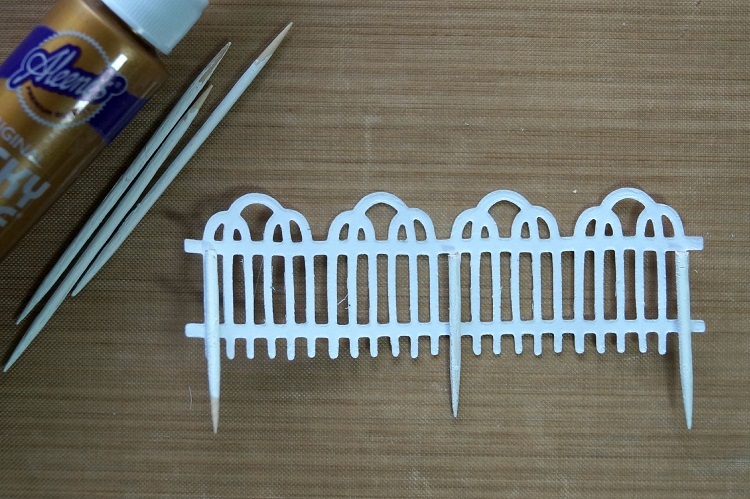 Paint 15 toothpicks white (set four aside to use for the mini pinwheels later) and let dry. 4. Die-cut 7 fence sections to fit around the disc. Cut 11 toothpicks in half. Glue one toothpick half on each end and middle of the fence with the pointed end facing down and insert fence sections onto the top edge of the disc. 5. Cut five 3-¾” square pieces of navy & ivory dot paper. Adhere to the sides and top of the cube. Glue the cube to the center of the disc. 6. Paint two bamboo skewers white, let dry, then cut them down to 5” long. Glue small blue beads to the top of each skewer. 7. 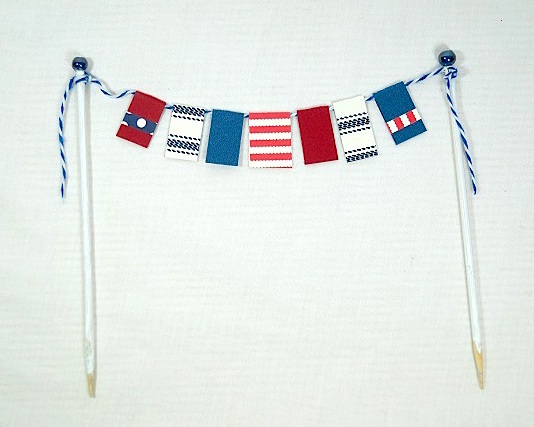 To make a pennant banner, cut small ½” flags from scraps of paper and cardstock. Adhere onto a 12” piece of blue and white twine. Tie ends of the twine to top of the skewers and insert into the disc. 8. To create the bottle rockets, paint two skewers red and let dry. Cut two pieces of red striped paper 1-3/4” x 2″. Wrap around a pencil to curve paper. Remove pencil and roll the paper tightly to form a small tube. Wrap a 1/2” strip of navy dot paper around tube. Glue a small piece of twine inside of tube to create the wick. Glue tube onto red bamboo skewer and insert into disc. Repeat for a second bottle rocket. 9. To make the rosette, punch two 3” scalloped circles from the Navy and Ivory Dots paper. Cut two strips of red card-stock – one 1-1/4”” x 12” and one 2-1/4” x 6-1/2” . Adhere the two strips together to form one long 2-1/4” x 18” strip. Score the strip every 1/4” down the entire length and accordion fold it. Glue the ends together to form a cylinder (use a good tacky glue). On a flat surface, gather the bottom of the cylinder tight while spreading and pushing down on the top to create the rosette. Glue one of the scalloped circles to the center and hold into place until the adhesive sets. 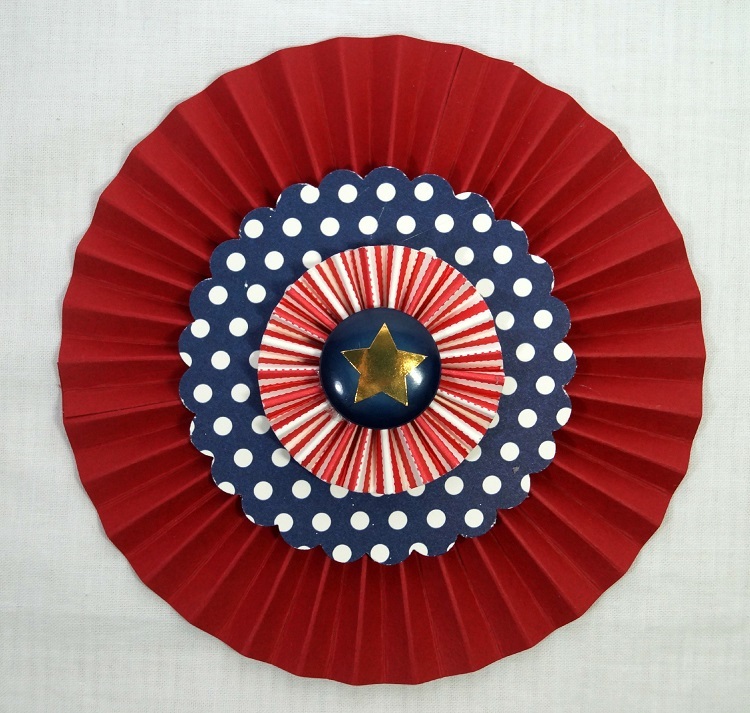 Turn the rosette over and attach the second scalloped circle onto the other side. 10. 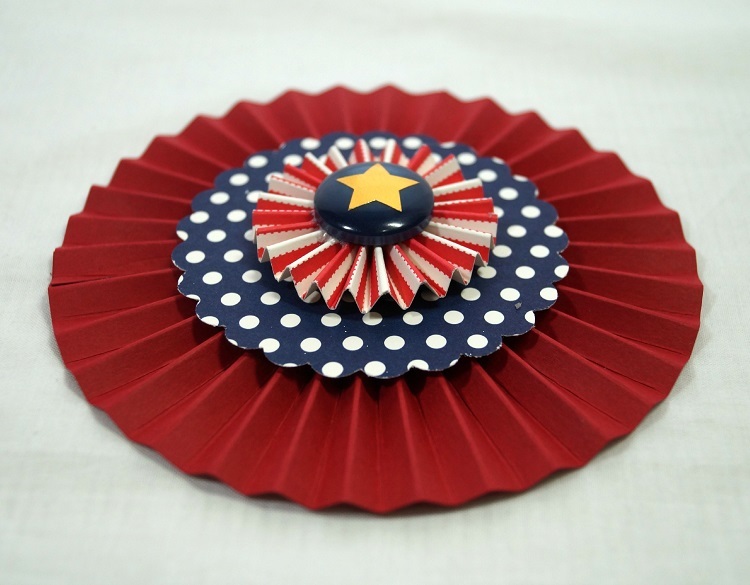 Create a second smaller rosette with a 1” x 12” strip of red striped paper. Glue a blue button into center, then when dry, glue it on top of the larger rosette. Add star sticker to the center of button. Paint a bamboo skewer blue, let dry and cut down to 5” long. Insert into the back of finished rosette and poke into the cube. 11. Create mini pinwheels by adhering 1” squares of paper together. On each corner, cut diagonally two-thirds of way to square’s center, dividing each corner into two points. Bring every other point to center so that the points overlap and glue into place. Glue a small red button to the center of each pinwheel. 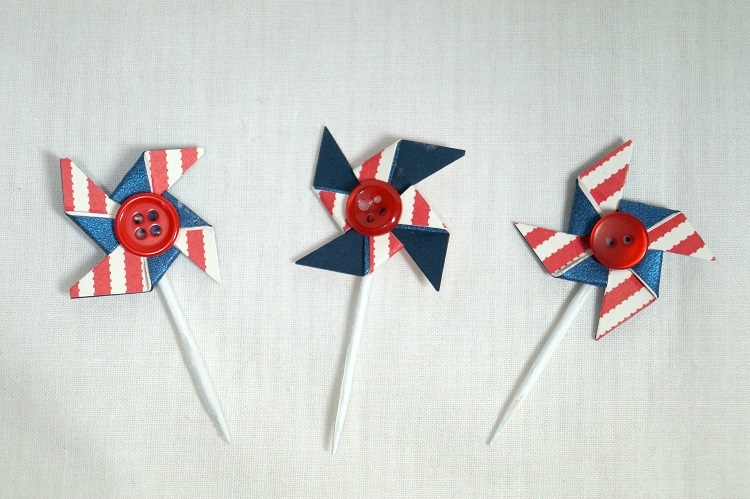 Glue the pinwheels onto white painted toothpicks and insert into base. 12. Print out the words “CELEBRATE” and “4th of July” onto white cardstock. Cut and layer to size and adhere onto picks and skewers and insert onto centerpiece. 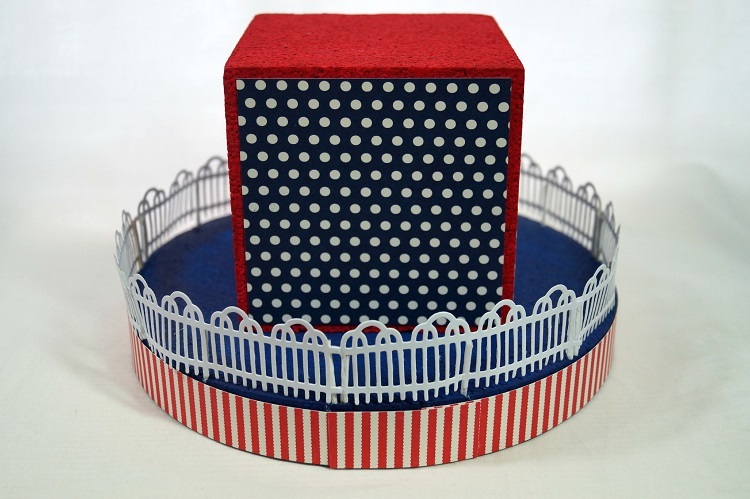 Create this and other fun DIY 4th of July decorations with Smoothfoam materials! 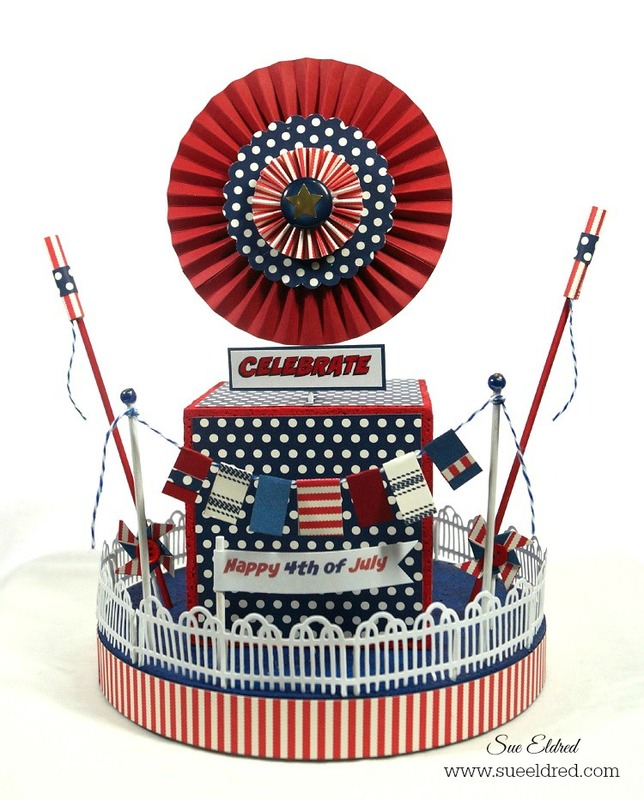 This entry was posted in Holiday Crafts and tagged 4th of July, Blue, Cube, Disc, Red, Tabletop by Sue Eldred. Bookmark the permalink.